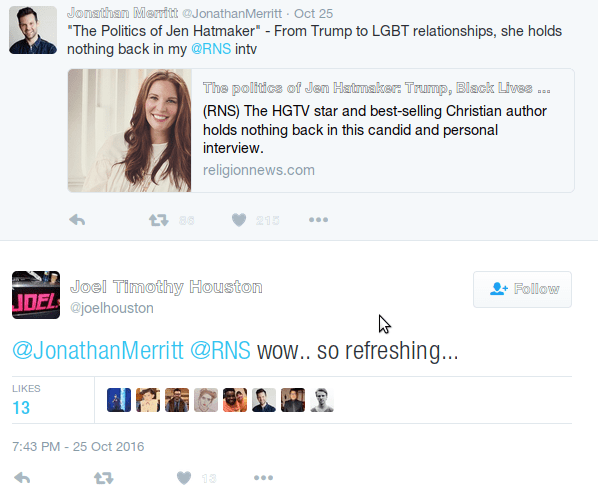 Lead Artist of Hillsong UNITED Finds Jen Hatmaker's Affirmation of Gay Marriage "Refreshing"
Recently we reported that the popular HGTV star and self-proclaimed Christian evangelist, Jen Hatmaker, came out and affirmed homosexuality. You can see the original post here. In summary, Jen Hatmaker believes that sodomites can come together in a union found to be holy and honoring to God, and should be accepted in the church. I would attend that wedding with gladness, and I would drink champagne. I want the very best for my gay friends. I want love and happiness and faithfulness and commitment and community. Yes. That’s an easy answer. Lifeway Christian Stores, a Southern Baptist Entity, subsequently pulled all of her books and materials from their inventory as a result. 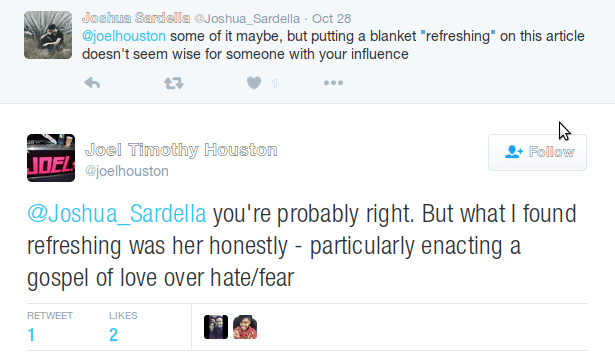 This coming out with the recent revelation that Houston’s co-pastor, Carl Lentz, has been severely compromising the gospel in public, among other things, it should be more than abundantly clear to everyone that Hillsong is a compromised imitation of the true Bride of Christ, and is led by people who know not the Scriptures, or what God has to say about His church. I would encourage any who listen to Hillsong music to stop. These men purport to be Christians yet habitually pervert His grace for profit. If your church plays their music, complain. You have the right to do so. Your tithes and offerings are lining the pockets of men like this.